One of the biggest areas of challenge for pet owners and trainers is dealing with dogs who are fearful, anxious or aggressive. It is very common for me to meet with a client or talk to another trainer and hear about how unchangeable these kind of problems are, especially when aggression is clearly a result of fear or anxiety. I often hear people talk about success in terms of relatively small changes over fairly long periods of time, such as 6 months to several years and these “improvements” tend to only be toward well known people such as “Well, Princess has really gotten a lot better with everyone in the house and she’s even coming around some with my mother in law” but don’t seem to affect new people, places or events. 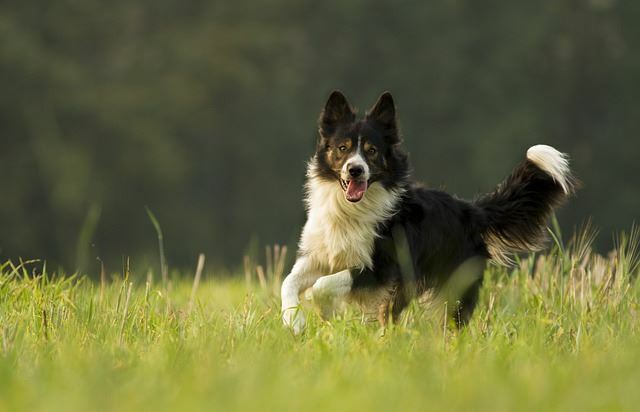 The dogs typically, often even with quite a bit of training or effort on the part of the owner, are still just as challenged by new people or circumstances as they ever were. In truth they have only acclimated to very familiar things but have not been fundamentally changed at all. Why is that? In my opinion this has largely to do with the dog’s perspective on the world, it’s expectations. A dog who is fearful or anxious is a pessimist. In any situation with which they are unfamiliar, and often even with those which they are quite familiar, they expect unpleasant outcomes. They typically go into many or even all situations basically on the edge of their fight/flight response, ready to run, duck, submit or bite at any moment. Imagine for a moment that you go out to dinner and as you walk through the door to the restaurant you duck in reflexive worry that something is about to strike you. The owner comes up to greet you and sticks out his hand to welcome you and you shy away. As you follow him to your table you are constantly turning and looking behind and around you, worried that any one of the guests or staff might at any time do something harmful or unpleasant to you. You get to your table and the owner pulls out a chair for you…and you jump back five feet and then only slowly regain some semblance of composure and creep back to the chair, only after the owner has moved to the other side of the table to seat your partner. The bus boy comes along to fill your water and you fall over backwards from your chair trying to move away from him reaching around you to your glass. This continues with the waitress who freaks you out by looking right at you waiting for your order. Finally your food arrives but your stomach is in such a knot from all the fear and worry you’ve been experiencing over the last 20-30 minutes that you can’t even eat much of it, you just pick at it and eventually take almost all of it home. Once home, in the comfort of your own space on your couch watching your favorite show you devour the food and then fall asleep from the exhaustion of being so on edge and stressed for so long. That’s the good version. In the bad version even after eating the food you get into some repetitive, self destructive behavior like chewing your nails till they bleed or pulling one strand of hair out after another. Now imagine this kind of thing going on ALL day, EVERY day. That’s how life is for many dogs living with fear and anxiety. And even worse they owners often look at their quaking dog and say, “She’s ok, she’s just a little nervous but she’ll get over it once you’ve been here awhile”. Not really the most empathetic response. 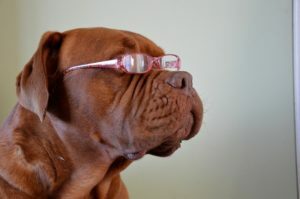 Personally I believe the primary reason so many owners respond that way is not really that they are so numb that they really don’t care about their dog’s discomfort but actually has to do with the fact that they either don’t believe the dog can be changed or have no clue how to help the dog change. The answer is actually fairly simple and straightforward, at least as to the overarching concept, you have to teach the dog to be an optimist, to expect good things from situation, including totally new situations or people to which the dog has no previous exposure! The typical answer we’re given to what a dog like this needs is “socialization”. S/he needs to be socialized more. What does that mean? In typical use what is meant is really just “exposure”. You are being told that you dog needs to be exposed to more of the stimuli that it has a problem with. I often refer to this idea as alligator swimming lessons. Suppose you never learned to swim and you were afraid of water, leaving aside the possible chicken and egg discussions of which came first. Someone comes along and says “I can teach you to swim in one quick lesson. Meet me at my boat tomorrow morning.” You show up and go out on his boat. He drives you to a lagoon and all around are alligators. He points to a dock a hundred feet away and says if you get up on there the alligators can’t eat you….and then shoves you in and takes off with the boat. It’s quite possible that you will learn to swim and make it to the dock alive but if you do so do you think you will now feel better about water? Will you have less fear of water or perhaps might you have an even more intense fear of water? Initially you may have had no clear or particular reason to fear water, you just did, but now you have a really good and concrete reason to fear water, you are absolutely certain you almost died in it and have a strong association with water, alligators and fear. This could be true even if in fact there were no alligators at all and you just imagined they were there. It may well be that the boat owner knew full well there were no alligators at all and wanted to show you that swimming was safe. He may even have tried to tell you, in a language that you didn’t understand or were just too afraid to panicked to listen to, that not only were there no alligators in this lagoon but also that the water was shallow enough that you could stand in it and that you didn’t have to get to the dock to be safe but just that it was a nice place to relax and sun yourself after a swim. If you are truly panicked about the water all of that could be completely lost on you and you would see the water and the whole experience through your own lens of fear and anxiety. You likely wouldn’t care that five other people joyfully got off of the same boat and had a great time playing in the water and that nothing bad happened to them, you were controlled by your fear and in your mind the whole event was a near death experience that you only survived because you frantically scrambled for the deck and by shear intensity of your action you managed to get out of the water alive. This is what happens with the most challenged dogs when people try to “socialize” them. All they are doing is repeating bad experiences for the dog. A question I like to ask owners and trainers who are doing this is, “Think of a food or a type of music that you really hate. How much of that food would you have to eat or how much of that music would you have to listen to before you would like it?” Of course people look at me with confusion or like I’m nuts. The question is absurd, everyone knows that repeated exposure to that food or music only makes them more convinced that they hate it. So why would this be different with the dog? Why would Rover all of a sudden decide that something s/he really didn’t like was all of sudden (or gradually) actually good and enjoyable? And of course that brings up a really important point, the best you could reasonably expect from this kind of repeated exposure in most cases is acceptance, not that the animal would actually come to like the stimulus, just as would probably not come to like that food or music that was repeatedly forced on you, at best you might just learn to tolerate it. For me, this is not a good result for our dog. I want the dog to move from fear and anxiety to comfort but even further to joy and happiness. I want the dog to learn to not just become some degree of comfortable with the things s/he used to be afraid of but get to a point where s/he likes and looks forward to those things. To do this the dog must move from pessimism to optimism. The dog must get to where it expects good outcomes, even in new situations with things or people to which it has not yet been exposed. That means it can’t only be good with something because it has seen that thing or that person or that dog many times but we must develop a way to communicate to the dog that something good is about to happen and that there will be a safe and desirable (from the dog’s perspective) outcome of the new encounter. This is not actually that hard to do but like all good training it begins at the beginning, not at the end. 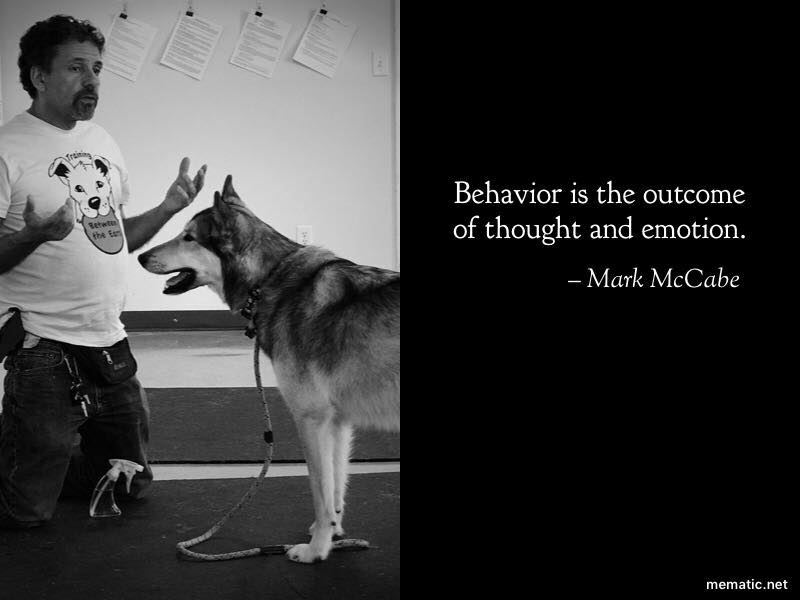 This means that we as owners have to first learn the tools and process of how this can be done and then we have to teach these tools and process to our dog in the simplest, least stressful situation possible and only increase the challenges as the dog has success with the prior level of challenge. It turns out this work can be done surprisingly quickly when done correctly and the dog can move forward quite rapidly. 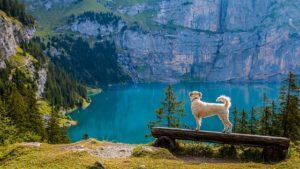 The most exciting part for me is when we see a dog encounter a totally new challenge but through communication with the owner and trust in the process engage it in a completely optimistic way, fully expecting a pleasant and rewarding outcome. Once the dog becomes an optimist the reasons for fear, anxiety and any associated aggression are simply not there any more and the dog can now truly enjoy a full life and his/her family can experience the joy they intended and expected in bringing their furry friend into their home.